We just returned home from a cross-state road trip to a family wedding. Because of conflicting work schedules, I had to drive along with the kids a few days before my husband was able to make the trip. While it was nowhere near the longest car trip we have taken, it was the first where I would be driving, navigating, and wrangling both kids myself. I came up with a few tips and tricks for making the trip easier, and I thought you might be interested in them too! Car DVD player: I would have killed for one of these when I was a kid. Car DVD players make car trips exponentially less hateful. Add in a few pair of comfy kid headphones, and life is good. Sticker books: Quiet, clean, and fun for the kids. Perfect car trip activities. Books on CD: For kids who aren’t quite old enough to read books on their own, books on CD are great for road trips. They can follow along with the story and pictures, which usually keeps them mercifully quiet. Lidded juice cups and drink concentrate: My son is past the sippy cup phase, but I still made him use a lidded cup in the car. I also packed Kool-Aid concentrate in my purse. No matter where we were, I could fill up the kids cups with water, add a small squirt of the concentrate, and they were happy. No need to spend a fortune on gas station drinks. Road tripping with kids who aren’t fully potty trained is stressful no matter what. Do you regress and put them back in training pants? Will they be too scared to use public restrooms (for good reason sometimes)? What happens if we get stuck in traffic? I don’t have good answers for all those questions, unfortunately. What I *can* suggest is that you lay a hand towel or seat pad under the accident-prone child in his car seat. It won’t magically eliminate the stress of traveling with a potty trainee, but it can at least reduce possible clean-up woes. Empty powdered drink mix containers are perfect for corralling child-size portions of road trip snacks. Fill each container with crackers or snack mix, pop on the lid, and place the containers within your child’s reach. Let them know when the trip begins that they have access to those snacks whenever they want them, BUT THAT IS ALL THEY WILL GET. Once the snacks are gone they are gone. This trick prevents the “I’m hungry” whining, followed by the driver trying to blindly dig around the floor of the backseat looking for some food to unwrap and chuck back at the kids. Well, most of it anyway. The more people in the car, the less likely it is that everyone will be happy with the temperature of the air conditioning. Make sure there are blankets readily accessible for the wusses who can’t stand the frigid temps required for the driver to stay awake for the long trip. I initially giggled at my mom for buying these dollar store bins to place between the kids on the trip, but they ended up coming in handy. The kids could reach everything they needed, and each item went back in the same place when they were done using it. We had far fewer toys and juice cups falling down in the cracks between seats this trip. 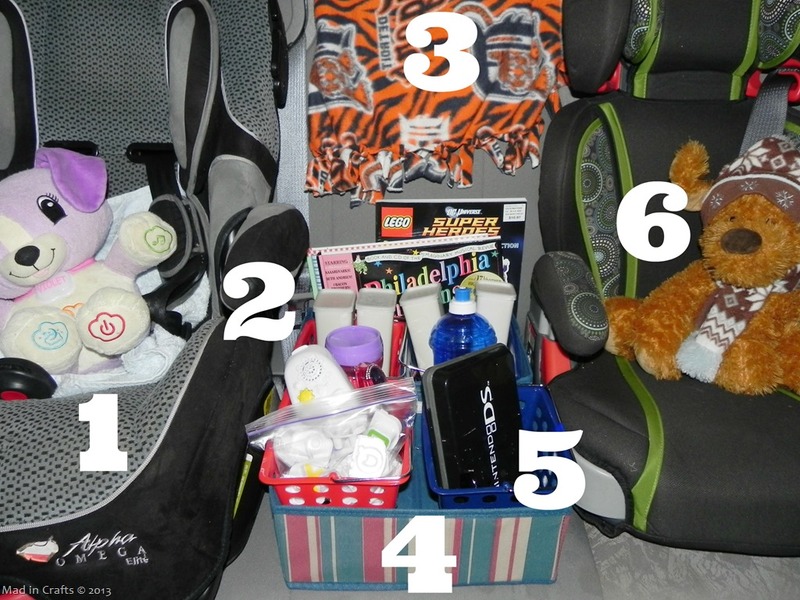 Before you leave, let the kids each choose ONE toy to use in the car. They get the ownership of choosing and taking care of that one toy and you stay out of the whole process. It’s good for them to be responsible for their own possessions; you have enough to keep track of on a road trip. Same deal as the toy. Just ONE lovey, and the kids are responsible for keeping it safe throughout the trip. These are some of the tricks that made our latest trip relatively stress-free. 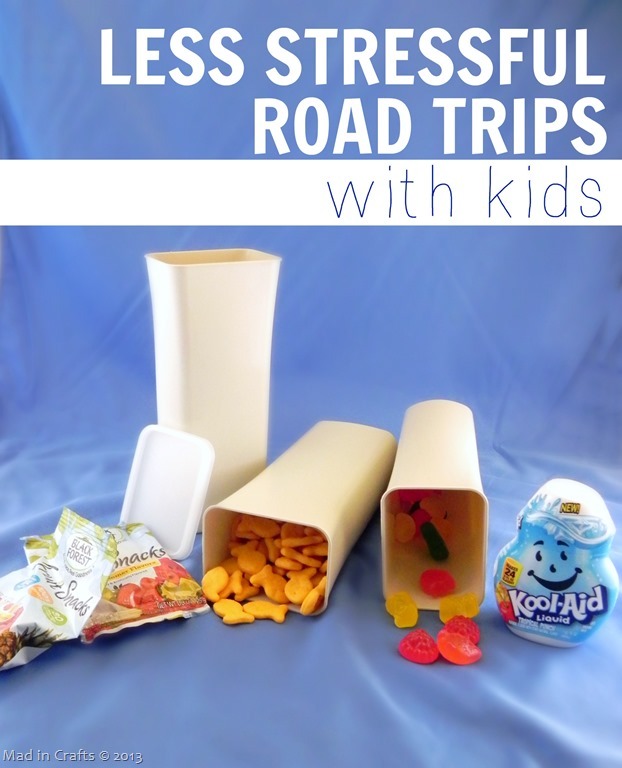 What are your best tips for road tripping with kids?